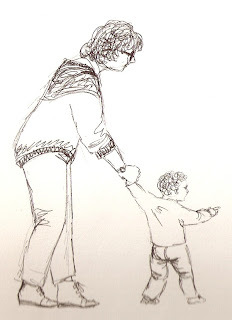 A sketch I did in 1987 of me with my nephew, Joseph, who is now 27. I am not a mother. I sort of chose this path. It was a conscious choice, but it was also something that just happened that way. I've been too ill for the last 12 years to consider it, and now a) its pretty much too late anyway, and b) I am too aware of all the little things I'd be giving up, like being able to shut the loo door. 1) Sympathy. That patronising look you get. Along with the manifestation of the halo. 'You'll never understand because you aren't blessed like we are'. Or worse, 'you'll understand when you have a baby yourself'. This really sticks in my craw because it assumes that being a mother is the only justification for a woman's existence. It is inevitable. Er, no. Just because I am child-free, doesn't mean I have less value than you. 2) Martyrdom. 'Oh, we can't come till three because little Chlamydia has her pony club that day, and we have to take Peregrine to his Thai Boxing for toddlers, and then there is the piano lessons and the ballet and the rugby and the swimming and...' WHEN DID IT HAPPEN THAT CHILDREN BECAME ALLOWED TO RUN THEIR PARENTS LIVES? When I was a kid, you got taken to Brownies or Cubs or whatever permutation of a pseudo-military children's group your parents believed in. Posh kids got music lessons. And maybe ballet lessons. But that was it. The rest of the time we were left to our own devices. We feel that we have to ENTERTAIN our kids continually now. They can't be by themselves. They can't do their own thing. And worse, the kids' appointments entirely take over some parents' lives. I know people who work harder outside of their employment than in it, just from constantly ferrying their pre-adolescent kids to various activities. They are never in. They dread the holidays because there is always something they have to take their kids to next. They never see their partners, except to waive at as they pass through the front door, one on the way to a drop-off with one child, the other on the way home from a collection of the other. So why should I have to organise my life around your kid's riding lessons and recorder club? Why should I listen to you talking about NOTHING ELSE except little Peregrine and Chlamydia because you haven't the sense to say no occasionally and have something else in your life? I know there are lots of parents who will be mortally offended, or who will say, 'you don't understand because you are not a parent'. True, but this is another symptom of Nazi Mother Syndrome. The assumption that just because I do not have kids, I don't have any experience of them, nor do I have any capacity for empathy, emotional intelligence or rational thinking. I understand guilt. 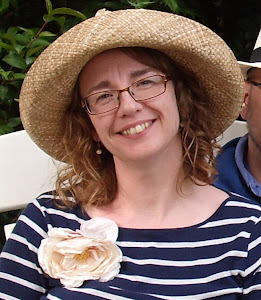 And I watched my sister struggle with the practicalities of having three children under the age of three, all in nappies, so believe me, I've seen how tough it is, and I have nothing but admiration for anyone prepared to do it. I just don't see why people who make that choice should expect to inflict their decision on me. There is a price to be paid for choosing to be child-free. I mourn the children I will never now have. At times it is heartbreaking. But I know my own capacities, and its the right choice for me. I don't evangelise about it. I don't inflict it on other people, and I hope they will do the same for me with their choices. I have qualms about publishing this post, because I know it will attract criticism. All I can say is, before you snarl back at me, open your mind a little. How do you respond to a child-free person? Really? That really irks me too. I always feel like screaming, "I asked what YOU'RE doing, not what your offspring is up to." I kind of wish I HAD been challenged about why I have no kids, then I could use the "I lost my willy in a freak arc-welding accident" and see what the reaction was. As it is, I surround myself with like-minded people and I can't remember more than one or two even vaguely offensive comments in my entire life, so I guess I'm lucky. Great piece Bex. I can totally relate to your rant. The most offensive (and topsy-turvy) thing anyone said to me pre-Sophia was 'You only decide to have children when you become unselfish'. What the bleep?!!!! I like Pat's arc-welding accident excuse - works well for the guys. Perhaps an equivalent for the women would be something like 'I tied my fallopians up in a freak knitting accident'. That really sticks in my craw too. Or at least it would if I hadn't lost it in a freak crawfish fishing accident.